If you're looking to establish a business presence in the US or attract American customers, you need a .us domain name. If you want to let the world know your business is all about business, then .biz is your TLD of choice. And we are proud to offer .co — so often associated with «company» or «corporation» — at a price you won't find anywhere else online. In case you thought your eyes deceived you when you read that headline, here again are our prices on new first-year registrations for these key TLDs: .us $4.88, .biz $4.98, .co $8.88. Get them before they're gone; these prices will not last forever. 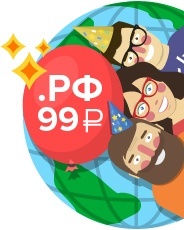 Also for a limited time, college students get an even better deal: Through Namecheap's educational program nc.me students with a verifiable university email address can get a .co domain name for only $0.99. Go there now, students! Спешим поделиться хорошей новостью — в период с 01 февраля по 01 апреля стоимость регистрации доменных имен в зоне .RU или.РФ составит 99 рублей за один год! Для активации данного предложения необходимо использовать промо код DOMAINTIME при оформлении заказа. How can you get in on these deals? It's all about timing. These offers will rotate throughout the promotion, changing every hour, so you'll want to check back often. When you see the deal you want, grab it! As an added bonus, you can maximize your Bitcoins on Black Friday. Friday Nov. 28 only, whenever you add 0.1 Bitcoin to your Namecheap account we'll include a bonus — an extra 20% midnight to 2am, 15% 2am to 6am, 10% 6am to 11:59pm. Visit bitcoinblackfriday.com for more info. See you at Namecheap on the 28th. Thank you for your business.